110 Rotarians and guests from across the district attended a luncheon at the Bridge Hotel, Walshford, and enjoyed an excellent the three course meal, with the main course served as a carvery. 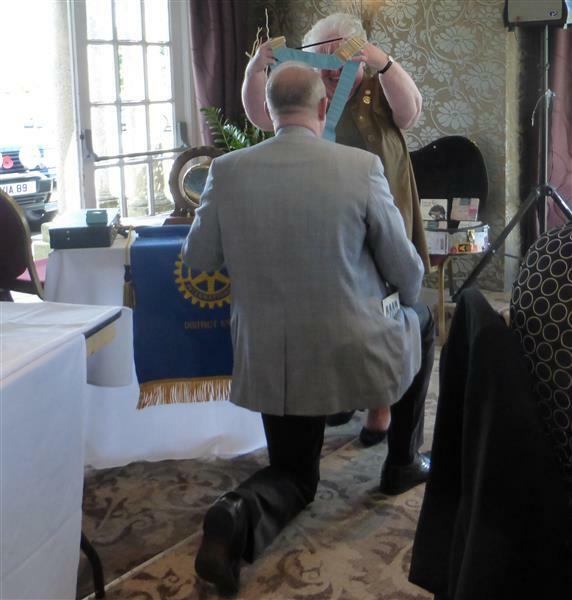 2015-16 District Governor Hazel Haas handed over the DG's chain to DGE Phil Poole, then received the Past District Governor's Jewel. PHil Poole then handed over the DG Elect chain to Robert Morphet, and the DG Nominee chain to Nigel Arthurs. Phil Poole made a short speech and asked all the District Officers, Assistant Governors and Service Chairs to stand and be recognised.He then presented bouquets of flowers to Hazel and to his wife. The final ceremony was the presentation of the District Governor's Home Club banner to the Rotary Club of Brighouse.